We Build Websites are really easy to edit! We Build Websites create beautiful websites that are uniquely designed for you. The real beauty of a WBW website is how easy it is to edit. No prior knowledge of website development or coding is required. If you can write a letter on your laptop or computer, then you will be able to update your website! Watch a short video by clicking on this link and you'll see how simple it it to edit our sites. they don’t want to have to create a website themselves. Our bespoke Content Management System (CMS) makes it simple to edit text and update images. 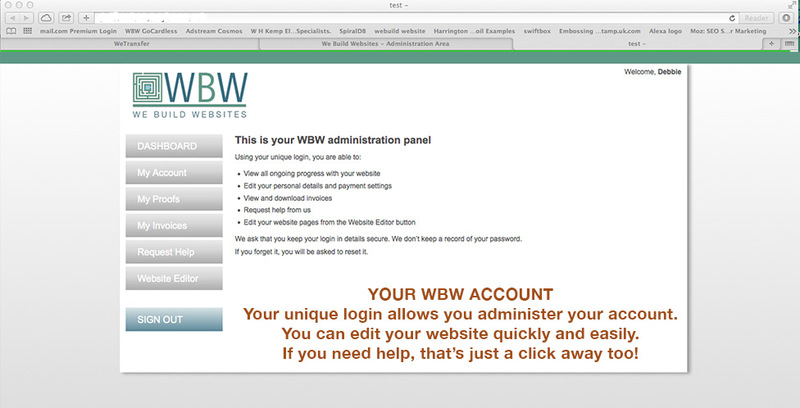 By logging in to your own We Build Websites Administration Account you can edit your website. Your WBW Account also allows you to update your personal details and your security password. Your invoices and your payment history can all be accessed from your WBW Account. You stay in complete control. From your WBW Account you will be able to see, and administer, your website (or websites if you have more than one with us). Once you are in Edit Mode you will always see a bright green bar at the top of all your website pages. The simplicity of a WBW website is you can see instantly what your text will look like on your website. The We Build Website system is WYSIWYG (what you see is what you get!). Adding text is simple. Click on the green pencil, next to the text block you want to update. In the same way that text is easy to add, WBW makes it simple to add photos to your site. Just click on the pencil and a dialogue box opens up where you can upload your photographs. Then just press the ‘tick’ box and it’s done – images online!